This is simply not true. 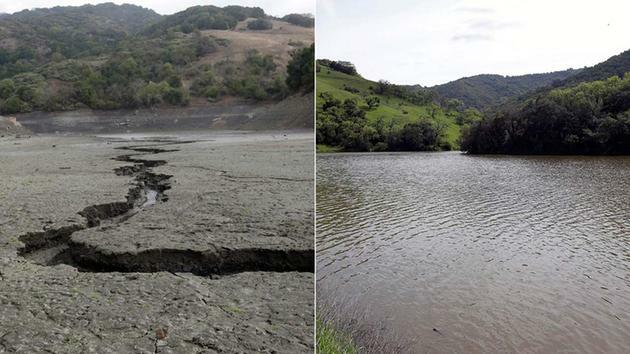 California had a deficit of over 11 trillion gallons of water just 1.5 years ago. In order to make up for this deficit it would have to rain at the intensity of this past storm every day for the next year. The water deficit is now well over 11 trillion gallons of water…in the 100s of millions of gallons over (possibly another trillion, easily). So then why the lie? So we run through the remaining water supply that much quicker. If we believe we are in the clear, then ‘save the drop’ goes out the window & we dwindle down the water supply that much faster. Why would they want this? He who controls the food & the water controls the people. Revelation 6 – The rider on the white horse bent on conquering. Doesn’t fire an arrow bc he doesn’t have too; in order to subjugate the people, he need only control the food, water & money. What proof do I have? Little less than a year ago they had an ingenious idea to put shade balls in the LA river reservoir, in order to preserve the water by shading it from the sun so that it didn’t evaporate. After a short time, the shade balls leeched a harmful chemical contaminating the entire water supply. They knew this would happen! There is more…The Colorado River was contaminated by the EPA. They turned the whole River yellow & called it an accident. 3 States depend on this river’s water, but now it’s contaminated. The EPA dumped the chemical at the Animas River which consequently contaminated the Colorado River well enough to completely discolor the water. The “Animas River” is also known as the river of lost souls. Flint Michigan – this goes w/out saying. Not a conspiracy, they knew & they did. Then they put the blame on certain officials that had known & kept quiet. They had a fallout guy/scapegoat. The Flint Michigan contaminated water was just 1 of many they covered…I have documented water contamination in more cities. Most recent 1 was in San Pedro, California. Pipe ruptures & water main breaks increased exponentially in the last 2 years. Lakes disappearing overnight leaving 1,000s of fish dead, this happened twice last year. I have more evidence documented. Too many instances for people to say, ‘it’s all a coincidence’…just a conspiracy theory, but it’s not; it is a pattern. So now they resorted to this…42% out of drought (rationally & logically speaking this is impossible, making this article satirical.) But, it’s enough to quell some fears in order that we burn through the very little water we have left. They believe in order out of the chaos; water rationing will do just that…cause chaos & ultimately serve as a catalyst in order to subjugate the people. SAN FRANCISCO — More than 40% of California has emerged from a punishing drought that covered the whole state a year ago, federal drought-watchers said Thursday, a stunning transformation caused by an unrelenting series of storms in the North that filled lakes, overflowed rivers & buried mountains in snow. The weekly drought report by government & academic water experts showed 42% of the state free from drought. This time last year, 97% of the state was in drought. Southern California, also receiving welcome rain from the storms, remains in drought but has experienced a dramatic reduction in the severity. Just 2% of the state, a swath between Los Angeles & Santa Barbara, remains in the sharpest category of drought that includes drying wells, reservoirs & streams & widespread crop losses. 43% of the state was in that direst category this time a year ago. California will remain in a drought emergency until Gov. Jerry Brown lifts or eases the declaration he issued in January 2014, while standing in a bare Sierra Nevada meadow that 1 of the state’s driest stretches on record had robbed of all snow.